Oshun is the African Yoruba goddess of love, fresh waters, and fertility. She is a Divine Mother goddess, very connected to her own sensuality and sexuality. She is the most compassionate and loving of all the Yoruba goddesses, and it is her gentle, healing, supportive, and loving energy that we honor at April’s full moon. This full moon is all about healing yourself emotionally, physically, and spiritually so that you are a full and empowered being ready to get down and do your soul work this summer. Oshun is a healer as well as a nurturer, who cares for the sick, poor, and anyone in need of her kind and loving energy. 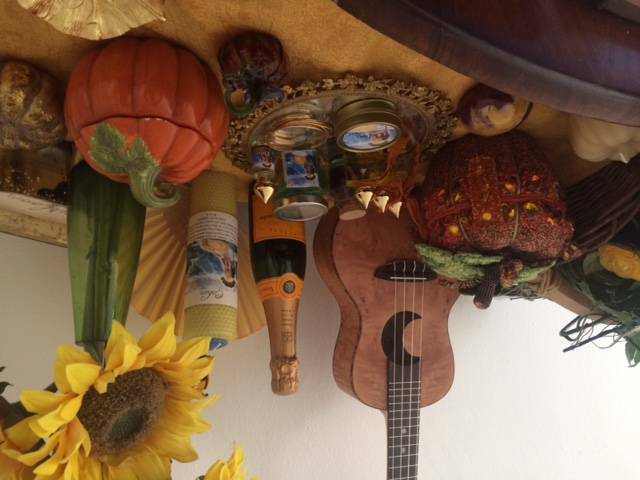 These tools exalt Oshun’s loving, sensuous nature, and her water-element energy which encourages mothering, harmony, and going with the flow. You will first receive in this set a rolled candle made of sheets of blue and gold beeswax. 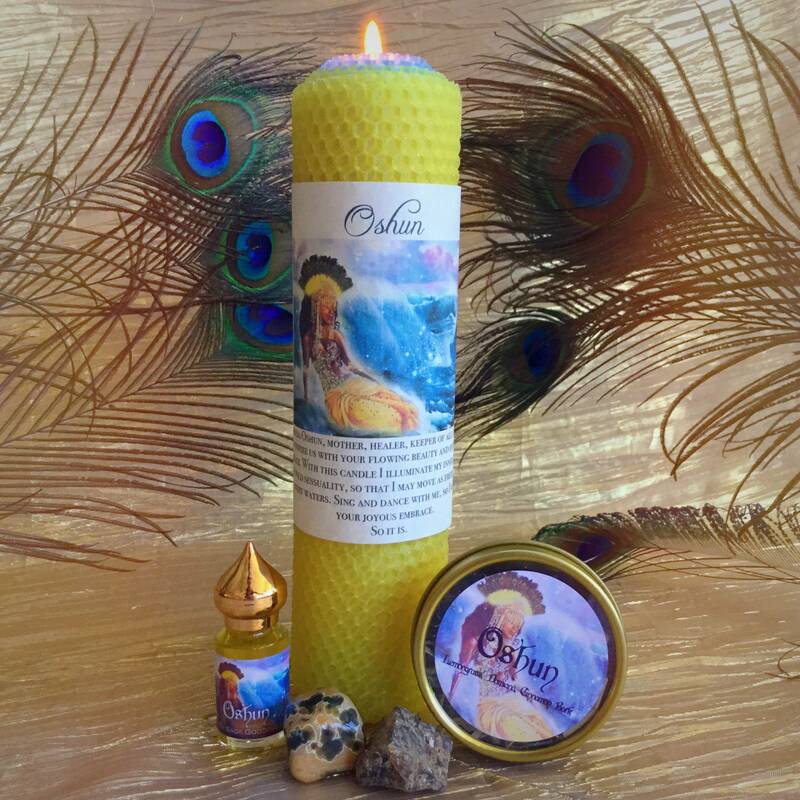 This candle comes anointed with my Oshun perfume and a blessing you can read to honor the goddess. Then you will receive a bottle of my brand new Oshun perfume, not available outside of this set. It is a sweet and feminine blend with notes of honey and lemon. Oshun’s stones are ocean jasper and amber. Ocean jasper is known as the happiness stone! It comes from only one riverbank in Madagascar and definitely brings the happy. Are you looking for joy and searching for peace? Ocean jasper is about to bring you the happiness you seek. I like to say that you can’t work with ocean jasper and be unhappy at the same time. Amber is a deeply protective stone that prevents psychic attack. It surrounds you with an energetic light shield to make you feel safe and held. It also brings health, and ignites your confidence and power. May Oshun bless your soul path with her healing and love, so that you may be nurtured and held in her comforting embrace. Oshun is my patron “saint” goddess and I keep an altar up to honor her at all times. This set sits proudly on her altar and I love it and I am sure she loves it too! Especially the perfume. Honey sweet! She is full of sweetness and works really quick to provide clarity, to reveal secrets and to seal deals. This queen is beautiful inside and out. This is my absolute favorite scent right now. It’s pure honey bliss and I can’t get enough of it. It lasts all day too! I want to stock up on this one. Oshun must be smiling. This set does such a good job in honoring her energies. I love the oil the most though! The Oshun goddess set is one of my favorites of the year. The candle has such a warm flowy feel to it, the perfume is divine, and I loved using the stones to make a honey jar. This was the first Goddess ritual set this year that really called to me. The yellow and the blue mix of colors for this set is so pretty. If you are a honey lover, you will love the Oshun perfume. It’s sweet and warm, like the sun’s rays! I can’t stop smelling this- can’t get enough. It is so soft, comforting, enveloping of a loving spirit. If a oil could give you a hug, this one is it.